Who says that working on Latin manuscripts and moral sayings is a dull pursuit? For about six years now I have been travelling to Italy, Germany, and France to gather information from several manuscripts so as to edit afresh an important collection of Latin one-line “sayings” or “proverbs” (sententiae or proverbia), which, despite its massive impact on ancient readers and its great potential as a modern teaching tool, has received little scholarly attention since the 1880s. Some years ago the most important, and in all likelihood oldest, manuscript containing part of this collection–manuscript K, dated to the early ninth century and for many years considered irretrievably lost–resurfaced and came my way in a most exciting fashion. I’ll explain how this happened after I give you some general background information. The collection I am working on probably contained (at least) 734 pithy sayings, most of which originally came from amusing (and perhaps indecent) Latin mime-plays that no longer survive. The plays would have been composed and acted by a mimographer (a mime-playwright), and would have been destined for live performance. We don’t know who separated the sayings from their theatrical context to compile the anthology or when he did so, but the collection seems to have existed in some form in the late second century AD and was at that time associated with the actor and playwright of witty and obscene mime-plays Publilius from Syria. In the early medieval manuscripts the sayings are arranged one per line in a single column grouped in alphabetical order only according to the first letter of the saying. Let me give you an example of five sayings (A5-A10) starting with the letter A (text and translation are mine). Ames parentem si aequus est; si aliter, feras. Aspicere oportet quidquid possis perdere. Love is taken on at will but not given up at will. A woman either loves or hates, there is no third option. Suspicion is vigorous on a gloomy side. Love your parent if he is fair; if not, put up with him. You ought to look carefully at whatever you may lose. If you should put up with a friend’s faults, you would make them your own. The collection was famous in antiquity, partly because of its edifying character and partly because of its language and style. Deceptively simple and remarkably dense, these sayings are perfect as exercises for beginners in Latin. Apophthegms such as “advise your friends in secret, but praise them openly” (secrete amicos admone; lauda palam) or “danger is never overcome without danger” (numquam periculum sine periculo vincitur) are found in abundance amongst the “Sententiae Antiquae” of Wheelock’s Latin, a textbook familiar to generations of students mainly in the US (but also at Glasgow University), and it is easy to see how they might have been used by tutors in antiquity to teach easy Latin morphology and syntax, while at the same time surreptitiously conveying ethical messages about character formation. This combination of learning and moral edification was at the heart of Roman education, and it is highly likely that parts of this collection were taught in schools from the first century AD down to at least the fourth century: St Jerome (†419) remembers fondly reading one of these sayings when he was a school-boy. At some point the original, large, collection of sententiae was “broken” into five or six groups or sub-collections, all of which circulated widely during the Middle Ages in Germany, France, and Italy. Today there are about 160 manuscripts known to contain the collection in one form or another. In Special Collections at our University Library we have two witnesses of the sub-collection known as the “Senecan collection”: this was the most widely circulated collection of the sayings, and several manuscripts belonging to it are dated to the ninth century. It contains metrical or almost metrical sayings beginning with the letters A through to N. But after the tenth metrical saying beginning with the letter N the sub-collection, suddenly and without any gap or signpost, continues with prose sayings, which begin also with N and then continue with words starting with O, P, Q, R, and so on, all the way through to Z. They are drawn from ps.-Seneca’s work De Moribus “On Character”, hence the name of the collection. The names of the Glasgow manuscripts are MS Hunter 205 (13th century) and MS Hunter 231 (14th century). The image reproduced below is from fol. 69r of MS Hunter 205 and shows the sententiae beginning with the letter D, and some beginning with the letter E.
These Hunter manuscripts are interesting and useful (I have used them with a postgraduate taught class that had little Latin and almost no palaeographical skills) but not particularly valuable in tracing good readings. The earliest (and most precious) witness to the ‘Senecan’ sub-collection is a wonderfully clear manuscript, now housed in Kraków, in the Biblioteka Jagiellońska. It is Berlin lat. 4° 404, and the “Senecan collection” of the moral maxims can be found in folios 32v-43r. It is conventionally represented by the letter K. My involvement with K has been brief but most exciting, and I regret that copyright laws do not allow me to reproduce here the part that contains the sayings. K dates to the early ninth century and remained unknown to classical scholars until 1863, when Theodor Mommsen found it in the private library of Ambroise-Firmin Didot, diplomat, publisher, and classicist (1790-1876). In an article published in 1863 Mommsen described the manuscript and explained its value, but recorded only the variant readings that pertained to the other main text K preserves, Cicero’s De amicitia; Mommsen did not discuss or record the sententiae. W. Meyer published his general study of the manuscripts containing the sententiae associated with Publilius in 1877, and his edition of the corpus in 1880, but, although Mommsen had clearly stated in his article that folios 32v–43r of K (or “codex Didotianus”, as it was then known) contained “sententiae Senece phylosophi”, Meyer made no use of the manuscript in either of his publications. K was auctioned by the London antiquarian Bernhard Quaritch in 1893. It seems that luck of funds prevented the Bodleian Library from buying it; in the end the Deutsche Staatsbibliothek in Berlin purchased it and catalogued it as Berlin lat. 4° 404. Meyer was still alive in 1893 (he died in 1917), but, so far as I know, there was no attempt by him or by anyone else to publish a revised version of his 1880 edition that would take into account the readings of K, which became available for consultation in the State Library in Berlin after 1893. Further attention was drawn to K in the second half of the 1920s, when there was a further description of the volume, a discussion of the style of the scribe’s writing, and an attempt to trace its provenance. But the focus of the analysis continued to be the first 32 folios containing the Ciceronian text of De amicitia, and no one offered a collation of folios 32v-43r containing the sententiae. J. W. Duff and A. M. Duff seem not to know of the existence of K, when they edited the sententiae in the Loeb Classical Library series in 1934. When the war broke out, K was brought to the East so that it might be protected from the bombing. It stayed there, but its location was not known to scholars researching on Publilius. K reappeared in the scholarly press in 1986; it was included in a list of Latin manuscripts which originated from the Staatsbibliothek Berlin and were currently housed in the Jagiellonian Library in Kraków. 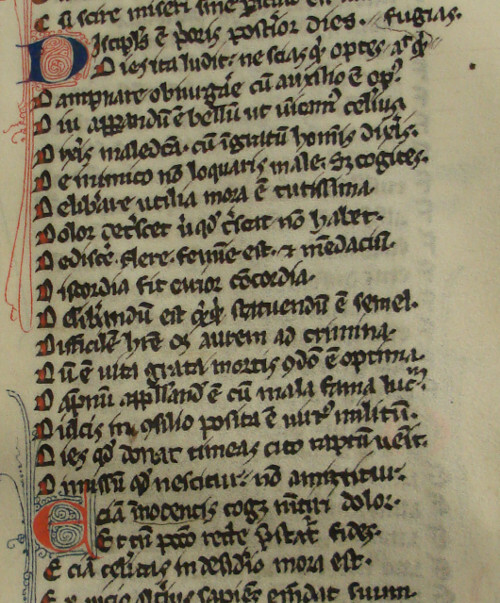 However, to the best of my knowledge, it continued to remain unnoticed until 2005, when a reference to it was made with relation to a poem of Eugenius, Bishop of Toledo, who was the third and final author contained in the manuscript (fol. 43r). K was officially catalogued in 2007, and I discovered its new location only because in October 2012 I took the initiative to contact the Staatsbibliothek Berlin, and asked if there was any further news regarding K. Having been made aware of its new location, I contacted the Jagiellonian Library and in November 2012 obtained a digital copy of the relevant folios. I was then also informed that an eminent historian and expert in Latin manuscripts, Veronica von Büren, working in Paris, had just been to Kraków, had already inspected the manuscript, and was about to publish a (brilliant) discussion of the place K has in the textual transmission of ps.-Seneca’s De Moribus. I got in touch with her and greatly profited from her knowledge, experience and generosity. I realised from our email correspondence that the part of K containing the sententiae had still not been fully collated or transcribed, and so I seized the opportunity to write an article on the transmission of the sententiae and to offer the first-ever full transcription of folios 32v-43r of K in a volume dedicated to the Proverbia Senecae published in late December 2013. K is superior to other early manuscripts not (only) because it is our earliest witness to the “Senecan” collection of the sayings but because it contains readings that are clearly correct and that do not appear in the other early manuscripts of the same branch. I am sure this is not my last manuscript surprise regarding Publilius’ sententiae. I have been informed that yet another anthology containing Publilian material has turned up in the Bibliotheca Capitolare in Verona. What a great place for a Publilian manuscript to turn up in! Macte uirtute! Could you give us the lpublication detals of article and volume?